In studying and posting about UK media coverage of the summer war between Israel and Hamas, we concluded that the Independent arguably surpassed the Guardian in the level of malice and vitriol directed towards Israel and its ‘Zionist’ supporters in articles and op-eds. Over a the course of a few days in mid-July, the Indy published an article by Adam Withnall seemingly characterizing a few dozen Sderot residents applauding attacks on Hamas targets as an act of almost unparalleled human cruelty; one op-ed by Robert Fisk which actually blamed the Western media for being too soft on Israeli “blood-letting”, and another op-ed by Yasmin Alibhai-Brown which accused Israel of engaging in a policy of ethnic cleansing. 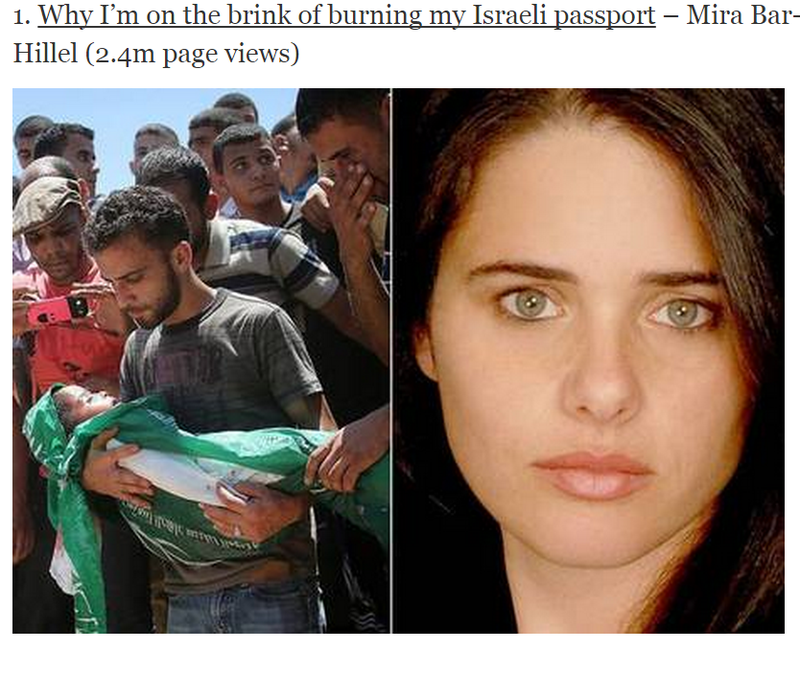 But, perhaps the most egregious example of unrestrained anti-Zionist malice during that period was provided by Mira Bar-Hillel, in an op-ed on July 11th titled ‘Why I’m on the brink of burning my Israeli passport‘, which suggested that the views towards Palestinians by some Israeli leaders were arguably on par with the genocidal rhetoric espoused by the Nazis. Well, on Dec. 30th, the Indy published the paper’s 10 Most Read Articles for 2014. Topping their list (with 2.4 million page views) was the ‘Nazi-Israel’ op-ed by Bar-Hillel. Another op-ed by Bar-Hillel, Israel has discovered that it’s no longer so easy to get away with murder in the age of social media, came in 8th on the Indy’s list. She complained that Jews smear people unfairly with the charge of antisemitism to “gag into submission any critic of Israel”. She accused British Jews (collectively) of ‘bombing Gaza’. She believes that “the message” of Jews controlling America is “entirely true” and “increasingly so”, and that Jewish lobbyists appear to be picking up some of the ideas from the Protocols of the Elders of Zion and using them. It’s important to contextualize this Indy approved anti-Israel vitriol by taking seriously reports by The Community Security Trust (CST), the British charity tasked with protecting Jews and Jewish institutions, and monitoring antisemitism. CST has noted that a “record number of antisemitic incidents” occurred in the UK during the summer (314 in July alone), and that the community had never before expressed such a widespread fears – fears only heightened by “the worsening nature of anti-Israel rhetoric”. The UK Office of Communities and Local Governments, in their new report on the upsurge in antisemitism this year, warned of the “impact of language and imagery in current discourse on Judaism, anti-Zionism and Israel”, and called upon the media “to …recognise that the way in which they report the news has significant consequences” for the Jewish community. So, how do Indy editors feel about such reports? The truth is that we don’t really know. However, it’s quite interesting that in Oct. 2013 the Indy actually published an official editorial strongly refuting accusations that the paper “demonised” Jews or Israel. The Indy claimed that the charges were “false”, “myopic” and “willfully ignorant” – words, we feel, quite aptly characterize some of the vicious smears directed against Israel published by the Indy during the 2014 summer war. If the Indy truly does take its reputation on the issue of racism seriously, their editors need to think seriously about the injurious impact on British Jews when they publish such incendiary attacks on Israel by a columnist who has openly admitted to possessing antipathy towards the Jewish community. I have maintained for some time that while the Guardian is fiercely anti-Zionist, the Independent is unashamedly antisemitic. Anti-Zionism is only a code word for antisemites. Mira Bar Hillel is part of the code, and not terribly well encrypted. Especially bizarre, given that The Independent is not a left wing paper. You forgot to mention that we still don’t know whether MB-H has burned her passport yet, but we presume she hasn’t…… Shame to give this windbag attention seeker’s histrionic empty threats yet more attention. I hope that she did it so she won’t be able to pollute the Israeli air anymore. Adam why are you calling it unrestrained anti-Zionist malice? It is is pure unrestrained antisemitism. Anti-Ziionism is only a politically correct veil on it. Mira Bar-Hillel is a disgrace to her name. I bet she comes from that notorious line of German-speaking Jews of the Austro-Hungarian Empire or Germany, who wanted to assimilate so much they turned against their Jewish roots to become the worst antisemites. Harvard Law professor Alan Dershowitz is unloading on President Obama’s “moral equivalence” in the wake of Tuesday’s shocking terrorist attacks at a Jerusalem synagogue that left five people dead, three of whom were Americans. The acclaimed defense attorney also accuses Palestinian Authority President Mahmoud Abbas of inciting the bloodshed. On Tuesday, terrorists stormed the synagogue in the Har Nof neighborhood in West Jerusalem. Using axes, knives and guns, the terrorists savagely interrupted morning prayers, killing three rabbis, another worshiper and a police officer. Police eventually killed the two terrorists. In his statement, President Obama condemned the attacks and said the deaths of three Americans meant shared grief between the U.S. and Israel. However, he was quick to urge all sides to renounce violence. Dershowitz said that was exactly the wrong thing to say. “It was moral equivalence. It was the wrong statement. It had all the wrong tone. It had all the wrong content. At this point in time, you unilaterally condemn only the Palestinian Authority and Hamas for incentivizing and inciting this kind of thing. You don’t bring it together with how many Palestinians may have died because they were being used as human shields,” he said, noting that the terrorist groups are fine with the U.S. and others in the world equating their actions with those of Israel. President Obama and Secretary of State John Kerry were quick to point to point out that Abbas condemned the attack. Dershowitz said that condemnation came after great pressure from the U.S. and that Abbas deserves the lion’s share of the blame for the attacks themselves. While the denunciation of the attacks by Abbas may have been grudging, Dershowitz pointed out that Hamas and Palestinians in the street made it clear they enthusiastically support such barbarism. “After this horrible, horrible massacre, immediately there was dancing in the streets in Gaza, in Ramallah, in Bethlehem and Nablus and celebration of these murders,” he said. “Although the great tragedy occurred in the synagogue, the most important events occurred before – the incitement – and after – the glee. How did the world respond? Spain unilaterally voted in parliament to recognize the Palestinian State without asking them even to stop terrorism,” Dershowitz said. However, he said the most common reaction worldwide was indifference. Dershowitz praised Israeli Prime Minister Benjamin Netanyahu for forcefully denouncing the attacks but also for imploring Israeli citizens not to seek vengeance on their own. The international response to the murders was so tepid that Netanyahu implored world leaders to speak out. Dershowitz said if the roles were reversed, it would be a much different story. The Middle East has long been viewed in the West as a problem that cannot be solved. Dershowitz said the Palestinians are undertaking a strategy to make sure it never does. Dershowitz said what’s worse than grisly acts of terrorism is the fact that it’s working to turn world opinion to the side of the Palestinians and others. World opinion has long tilted heavily against Israel, even when American presidents have vigorously defended it. Dershowitz admitted the U.S. can only do so much to reverse that, but he said there’s one thing the Obama administration can do in the coming days to prevent terrorists from scoring a major victory. Were their any Indy article’s on this. “Did you murder Jews? Have you abducted children? Get up to 12,000 shekels a month from Abu Mazen!” – the salaries paid out to Palestinian terrorists are actually enshrined in PA law. 4 out of 5 Palestinians support stabbing random Jews in Israel. The Palestinian Center for Policy and Survey Research just released their latest poll on Palestinian Arab attitudes. 80% support and 20% oppose attempts by individual Palestinians to stab or run over Israelis in Jerusalem and the rest of the West Bank. An overwhelming majority (86%) believes that al Haram al Sharif is in grave danger: 56% believe that Israel intends to destroy al Aqsa Mosque and the Dome of the Rock and replace them with a Jewish temple. The two are related, but not in the way the pollster claims. Both of those findings as a result of Mahmoud Abbas and his state-run media, not to mention the incitement from Hamas and other terror groups and plenty of social media, that constantly lie about Jews “desecrating” and planning to destroy Al Aqsa, as well as inciting people to defend it “by any means necessary.” Arabic media has been in a frenzy over, literally, nothing and the broad-based support for murder comes directly from this incitement at both the political and media levels. 56% support return to an armed intifada…Three months ago, support for a return to armed intifada stood at 50% and six months ago at 41%. Israeli policy hasn’t changed. The amount of incitement in Arabic media and from “moderate” politicians, on the other hand, has increased a great deal. And through some strange freakish logic, many Europeans and “progressives” use these sorts of findings as a reason to give the would-be murderers more and more, in the hope that they will be appeased. Best article on what Israel is dealing with? How does a human being (or two) walk into a synagogue and begin hacking at worshippers who are immersed in prayer, leaving behind a trail of blood, victims, grief and horror? The question is misplaced because no “human being” could do such a thing. It would have to be a beast in human form, a relic from primitive times before true humans became civilized. The Arab-Muslim animals that span the globe chopping, hacking and merrily decapitating – from Iraq to Jerusalem to New York to Oklahoma, and places in between and beyond – are a discredit even to the term “animal.” Most animals are not that brutal. The real issue confronting Israel for decades and the civilized world today is what to do about the proliferation of savages who lust for blood and derive inspiration from their religious texts? One example not to follow is that of President Obama’s. In one of his more ludicrous statements in the last few months – amid a healthy competition – he decried the attack, the loss of life “on both sides (! ),” and then added this gem: that the “overwhelming majority of Palestinians…want to live in peace.” Really? And based on what data was that determination made? That only tens of thousands of “Palestinians” rejoiced after the massacre, singing and dancing in the streets, distributing candies and sweets, praising the vicious slaughter and the slaughterers – and not hundreds of thousands? Polls in the PA reveal widespread support for the murder of Jews so what exactly is he talking about?? Obama seems to be as much an expert on “Palestinian” society as he is about Islam generally. His incessant protestation that ISIS distorts Islam is based on…what exactly? ISIS and sundry other radical groups seem to feel that they are fulfilling the dictates of Islam – and the few Muslims who disagree meet their fate at the business end of a machete. Actions speak louder than words. Obama’s expertise in Islam has led him to cede the Middle East to the most ruthless forces, embrace the radical Muslim Turk Erdogan as an American ally, and facilitate Iran’s acquisition of nuclear weapons. Perhaps with a nuclear weapon, Iran will be civilized, or so the thinking goes. Little can or should be expected from Obama or from the Europeans, mired as they are in cultural deterioration, moral relativism, population decline and Muslim-inspired Jew hatred. Sweden just became the latest country to recognize “Palestine.” Sweden (! ), which willfully encourages those who favor the shechita of Jews even as they themselves ban the shechita (ritual slaughter) of animals. How is that for misplaced priorities and corrupt values? And we should be clear, as the wave of recognition sweeps Europe in the coming year: any country that recognizes a “Palestine” is endorsing the mass slaughter of Jews. But Israel has to act, especially as the violence has spiraled out of control. The dynamic needs to change, dramatically. At a certain point, the unrestrained behavior of unruly animals becomes the fault of the zookeeper, not the animals. What can be done? Clearly, many things can be done that should not be in print, but the general approach needs to be the abandonment of defensive, reactive moves and an embrace of offensive, anticipatory, and proactive moves. The Arabs need to feel that they are paying a heavy price for murdering Jews. Right now, not only do they not pay a heavy price but the murderers and their families benefit. Here are some suggestions to change the dynamic, and they are all based on a single premise: that there is a war for the land of Israel that is being waged, and the Arabs who dwell in the land of Israel are the enemy in that war and must be vanquished. Israel should make clear that a Palestinian state will never be created between the river and the sea. There will be no non-Jewish national entity tolerated. The Muqata in Ramallah should be destroyed and “President” Abbas should be incarcerated as a war criminal. Anyone who riots or throws a stone at a Jew should be shot – with real bullets. Rubber bullets and tear gas should be sold to the Amish. Those who wish to be martyred and who celebrate death should be accommodated as often as possible. The media should be barred from scenes of violence, cell service canceled and cameras confiscated, like in most war zones. In the meantime, Arab access to the Temple Mount will be denied for at least six months, and Jewish prayer will be allowed thenceforth at permissible locations, such as they might be. It is unconscionable crime to deny Jews the right to move their lips on the Temple Mount! And those who refrain from ascending the Mount for halachic reasons will surely agree that if Jews cannot be there, certainly Muslims cannot be there. And perhaps the day will come in the near future when the mosque and the dome can be uplifted intact and reset in Saudi Arabia, Syria or wherever it is wanted. (The Arab countries can fight over it if they want.) That itself will preclude any Arab claim to Jerusalem. The same restrictions and limitations would pertain to the Cave of Machpelah in Hevron. Any terror emanating from Hevron results in closure of the facility to Muslims. In fact, we should apply to Muslim holy places the exact same respect and deference they have shown to Jewish, Christian, Buddhist and Hindu holy sites across the world. That seems only fair. As noted here in the past, measures need to be implemented that encourage Arab emigration – the payment of stipends, compensation for property, etc. Thy must be made to feel that that they have no future in the land of Israel – no national future and no individual future. Start with the Arabs of Judea and Samaria who are stateless; they deserve to find a country in which they can be full citizens and make their contribution to society. Let them demonstrate in an Arab country their dexterity with bombs and their grace with machetes. (If Israeli Arabs persist in their support of terror – now at a low level, but who can predict the future? – they should forfeit their citizenship and be returned to military rule as it was before 1966.) Of course, those who wish to stay and be peaceful, acknowledging the sovereignty of the Jewish people in the land of Israel, are welcome to stay. But an enemy is an enemy – and one who wants to kill you, maim you, blow up your buses, trains and restaurants, run over your pedestrians and conquer your capital is an enemy, and a ruthless one at that. Why so many Israelis do not perceive that is an enduring enigma, an enigma that has enabled the relentless slaughter of Jews. There are other measures as well but here is the problem: not a single method above will be enacted. That is why right now there is absolutely no deterrent to the murder and maiming of Jews. Indeed, it is exactly the opposite. The slaughter of Jews is incentivized in Arab society. Often the terrorist is killed (martyrdom and virgins), lionized and immortalized with the naming after him of streets, schools and camps (eternity), and his family receives a monthly pension of thousands of dollars to compensate for his lost earnings (financial reward). Under those circumstances, and given the primitive culture in which they are raised, it is an irrational act not to want to murder Jews. That is the dynamic that has to change. Yet, despite everything, much of Israeli society still clings to the illusion that “peace” is possible with these savages, or at least that someone, somewhere, sometime, will sign a peace treaty with them. That illusion is slowly receding, but it is still abetted by the elites of Israeli society, especially because it is being propounded and pushed by Western governments like the US and in the European Union. There is no more deadly illusion on the planet, except for construing ISIS as a cold summer treat enjoyed by children. Rational thinkers will argue that the “world” will never tolerate such Draconian sanctions, that countries will sever diplomatic relations with Israel, cut off trade ties and completely isolate the Jewish state. And, in the short term, much of that is true. But is there an alternative short of national suicide and self-immolation? Israel has much to offer the world, without which many people in the world would suffer, that such alienation will be short-lived. And Israel’s pivot to Asia (much more successful than Obama’s clumsy and failed one) has allowed Israel to strike close relations with the two largest nations on the globe, China and India. Neither country is moved in its foreign affairs by a moral impulse and both countries are anxious for military ties with Israel. And do not overestimate the popularity of the Palestinians in the rest of the world; truth be told, they are reviled even in the Arab world, perhaps even more than in Europe. We should not ignore as well the rank hypocrisy that promotes the double standard that cripples Israel’s ability to defend itself. Case in point: this week, Egypt evicted thousands of Arabs along the Gaza border and destroyed hundreds of their homes for “security reasons.” No courts, no appeals, no process. Some of the homes were being used to conceal tunnels, so they all had to go. Moral? Not in normal times, but Egypt recognizes it is at war with a heartless enemy, and that enemy and its population deserve no accommodation. Even Jen Psaki found no fault in Egypt’s actions, the phony. If only Jews would realize the same and stop fantasizing about convincing that enemy of our own goodness. Here is one exercise that should help: the same enemy that lynched soldiers in Ramallah and tore them apart is the same enemy that butchered holy Jews this week in Har Nof is the same enemy that kidnapped and murdered three precious boys just a few months ago. It’s the same enemy. And that enemy rides our buses, shops in our malls, drives on our roads and lives just two miles from us. The same enemy. Do you know where that enemy is, and what he is plotting right now? Change the dynamic. Change the terms of the debate. Change the rules of war. And change the outcome that the enemy now anticipates. Such will save Jewish lives and even bring redemption. Mira Bar-Hillel is a court jester doing “anti-zionist” schtick for the antisemites. Such antisemitic Jews have been a highly valued commodity in Europe for centuries. Mira Bar-Hamass is an Uncle Tom. Indymedia likes supporting Palestinian barbarians. Fatah called the terror attack “an operation at an occupation synagogue in occupied Jerusalem.” On Nov. 18, 2014, the two Arab terrorists from East Jerusalem entered a synagogue in Jerusalem and attacked worshippers with guns, knives and axes, killing 4 worshippers and a police officer. 7 people were injured, 3 of them seriously. The terrorists were killed in an exchange of fire with Israeli police that arrived on the scene. Palestinian Media Watch also showed that Abbas’ condemnation of the synagogue massacre was later explained away by Fatah officials as a condemnation for diplomatic reasons only. When Abbas later condemned the hostage taking in Australia by an ISIS affiliate and the subsequent killing of two of the hostages, PMW compared the two condemnations, showing Abbas’ condemnation of the synagogue killings to be insincere. I say let it burn! Maybe she’d like to take up residence in one of the Progressive countries surrounding Israel? Good riddance to trash. Why is the British press obsessively anti-Israel, and the U.S press isn’t? One must attribute it to anti-Semitism. In the U.S journalists actually know Jews personally. have Jewish friends, etc. In Britain people’s prejudices run wild. One more thing, no paper can publish Mira Bar Hilliel and retain any credibility on the issue of anti-semitism. She is a sick, sick, woman.